The Ship Inn01621 785057work01621 785547fax InnThe Ship Inn offers 3 boutique en-suite guest bedrooms. All our rooms are beautifully decorated, benefiting from king size beds dressed with premium Egyptian cotton bed linen – just what you need for a good night’s sleep. 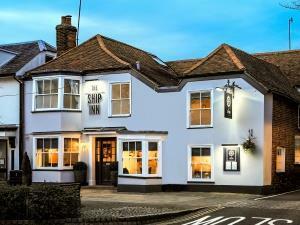 The Ship Inn offers 3 boutique en-suite guest bedrooms. All our rooms are beautifully decorated, benefiting from king size beds dressed with premium Egyptian cotton bed linen – just what you need for a good night’s sleep. All rooms have free Wi-Fi, a flat screen television, bathrobes, slippers, a Nespresso coffee machine and mini-bar. We provide a continental breakfast. Parking is available on site. The Ship Inn is located on the High Street a short walk away from the river frontage. There are beautiful walks in the district. Burnham also benefits from a pleasant park, a leisure centre and its own heritage cinema.